What is a Colorectal Surgeon? A colonoscopy is a procedure performed on a clean, prepared colon using a flexible scope with a video camera to visualize the entire colon (also known as the large intestine) and possibly the last part of the small intestine. 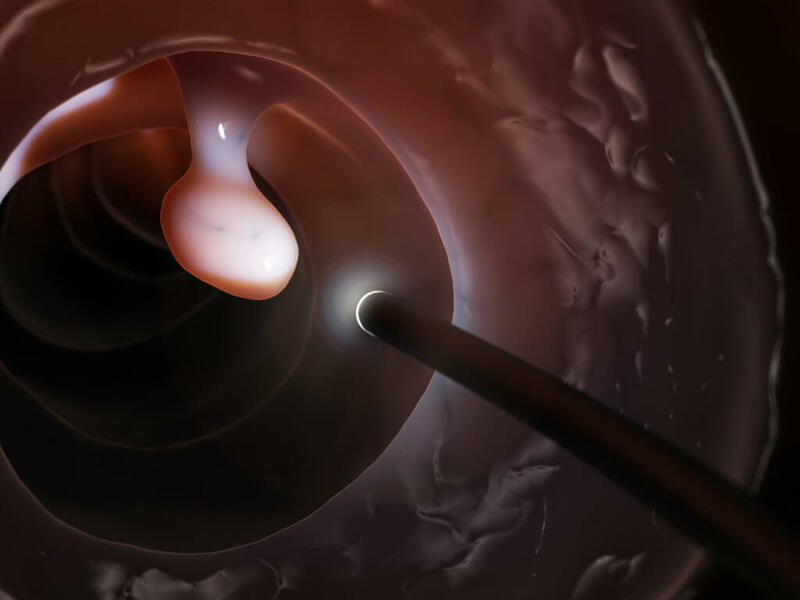 Colonoscopies are performed to examine the inner lining of the bowel to discover growths, such as colon cancers or polyps, or to evaluate for other sources of bleeding. If polyps or unusual growths are identified during the procedure, your surgeon will remove the tissue and have it biopsied (polypectomy). The procedure usually lasts 20-30 minutes but can take longer if polyps are present, if the colon is excessively long or twisted, or if excessive scar tissue exists. The extent of time required from check–in to check-out is approximately 2 hours. The procedure is done under deep sedation with IV anesthesia administered by an anesthesiologist. This allows the patient to sleep through the entire procedure without concerns that the procedure might be painful or difficult to go through. The drugs used for this anesthetic rarely result in nausea or vomiting. Some patient might experience some cramping or “gassiness” after they are awake but this resolves after a short time. You should receive instructions for preparing your colon in the office when discussing the procedure with your physician, otherwise known as “bowel prep”. There are a variety of bowel preparations available. The one recommended by your surgeon will depend on variety of factors, including patient preference. This can be discussed with the surgeon at the time of your initial visit. It is important to note that patients should avoid blood thinning medication starting a week BEFORE the procedure and should continue a week after the procedure if biopsies or polyp removal have occurred. Medications that should be avoided include aspirin, ibuprofen, Motrin, Advil, Celebrex, Coumadin, Plavix, and other medications in similar drug classes, as well as vitamins and herbal supplements. You should always check with your primary care physician before altering any medication. Except for blood thinning medications, most medications can be taken the morning of the procedure with a sip of water. Due to the IV sedation, patients cannot drive home after the procedure and should not drive that day. You must make arrangements to have someone there to take you home after the procedure. Even if you want to take cab home you MUST have someone with you that will be responsible for you. This is a hospital and surgery center policy; you are not allowed to go through the procedure without a responsible person to accompany you home. You can expect to be able to return to work the following day. You should avoid going out of town after the procedure for several days due to delayed symptoms that can occur with rare complications. Complications are not common. These will be discussed with you by your surgeon during the office visit prior to the procedure. If a complication does occur, it will be treated and managed by your surgeon. This could require hospitalization, medication, additional procedures, blood transfusion or surgery. The post colonoscopy discharge instruction sheets will advise you on events to look out for once you return home. Visual results will be given immediately, both verbally and written. Results will be discussed with you and to whom you direct. You may not remember clearly after the anesthesia so it is helpful to be able to discuss results with family members waiting for you. Pathology results will be available after 10 days. If you have not heard about the results after 10 days, please contact our office for your results. A report will be sent to your referring physician; if one is not received, please notify us. After a routine colonoscopy, an office follow-up is not usually necessary. Your next recommended colonoscopy is based on family history, findings at the time of colonoscopy, pathology results or other risk factors. Our offices are open today.